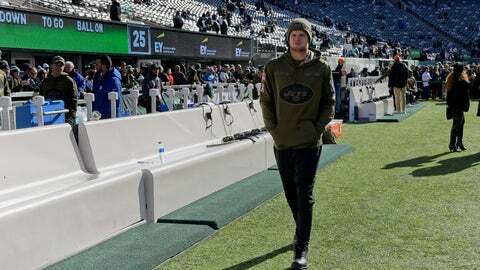 FLORHAM PARK, N.J. (AP) — Sam Darnold had his jersey and helmet back on, a positive sign for the New York Jets rookie quarterback. He still sat out team drills again Wednesday, making it more likely that he’ll miss his second straight game. Darnold suited up for practice for the first time since injuring his right foot nearly three weeks ago, and coach Todd Bowles said he’s progressing. But it’s uncertain if he’ll be healthy enough to play Sunday against New England. Darnold was injured at Miami on Nov. 4 and sat out the Jets’ next game against Buffalo on Nov. 11. Josh McCown started in his place and would do so again if Darnold is unable to play. Darnold was in a walking boot for a few days leading up to the team’s game against Buffalo, and remained in sweats as an onlooker during the team’s past few practices before Wednesday. He appeared to have no restrictions during light warmups, but did not throw a pass during the 30-minute window the media are allowed to watch. The No. 3 overall draft pick leads the NFL with 14 interceptions and threw just two touchdown passes with seven INTs in the three games before the injury. Darnold’s struggles had some fans and media wondering if a break from playing could do him some good. Darnold still has a chance to play if he can get in a practice or two during the next few days. While it’s rare for Bowles to have a player active despite not practicing all week, Darnold doesn’t think it would be an impossible task for him. If the 21-year-old Darnold starts against 41-year-old Tom Brady, it would mark the largest age gap between starting quarterbacks — 19 years, 306 days — since the AFL-NFL merger in 1970. Consider this: When Brady made his NFL debut for the Patriots in November 2000, Darnold was only 3. NOTES: WR Robby Anderson (ankle) did not practice and wasn’t on the field — not a good sign for a player who also had a bye-week break. Anderson didn’t play against Buffalo and could sit out for the third time in four games. “He’s sore, but he’s coming along,” Bowles said, adding that there’s no thought yet of shutting Anderson down for the rest of the season. … Also sitting out practice were: S Marcus Maye (shoulder/thumb), LG James Carpenter (shoulder) and LB Brandon Copeland (elbow). WR Quincy Enunwa (ankle) was limited.